This weekend I participated in ‘ERNA Matk’ a hiking challenge held by the Estonian scout organization. 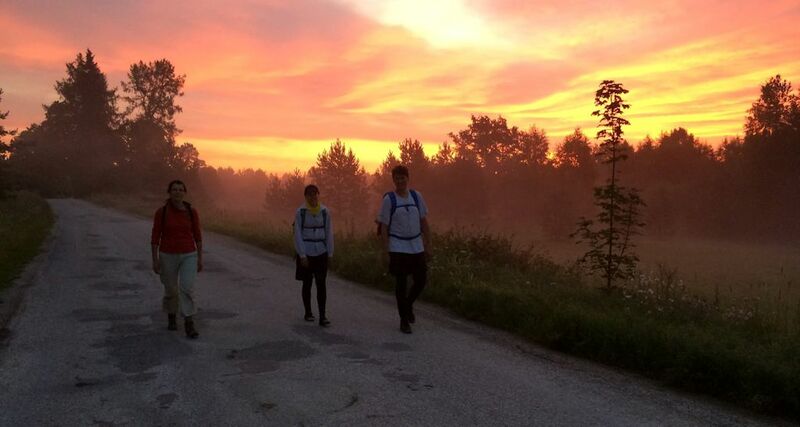 This is an annual event open to all who are interested in testing their mettle in two difficulty levels of hiking – Tümleri (24 hours long) and Hauka (36 hours long). This year the hike took place from Lehtse to Kautla, officially about 30 km apart but this did not take into account checkpoint locations so the real hike would most likely be longer. 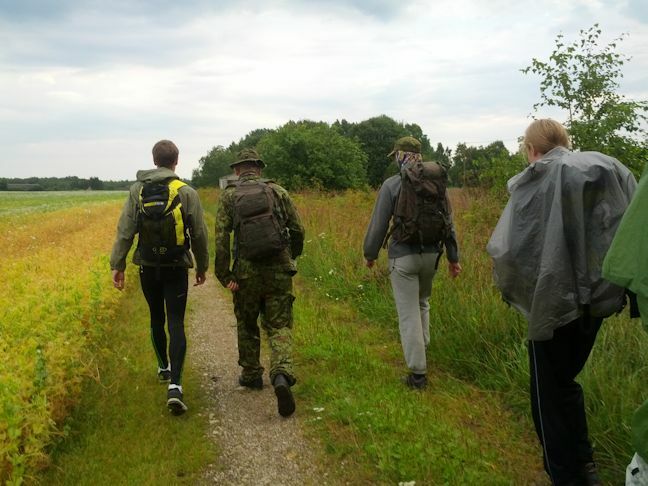 I first heard of this event when the one of the ESTCube leads, Mart Noorma asked me if I was interested in participating since he knew I liked hiking. Of course I agreed, not exactly knowing what I was getting into. We eventually had two teams formed at the Tartu Observatory, ‘Eesti Kosmosekeskus’ with 5 members and ‘THR Teadusmalev’ which I joined with 5 other people. When I first joined this hike I didn’t really know what to expect from it. When I told my Canadian friends that I was participating, I was mostly met with best wishes and not much more. Only after I shared the information with my Estonian friends did it slowly start to dawn on me that this was a pretty serious competition here, as a lot of people reacted with shock! As if I’d gone crazy! Well, I was already locked in with my decision, I would participate in this competition. Besides, it seemed like a fun challenge! Of course we needed to prepare for this hike as well. 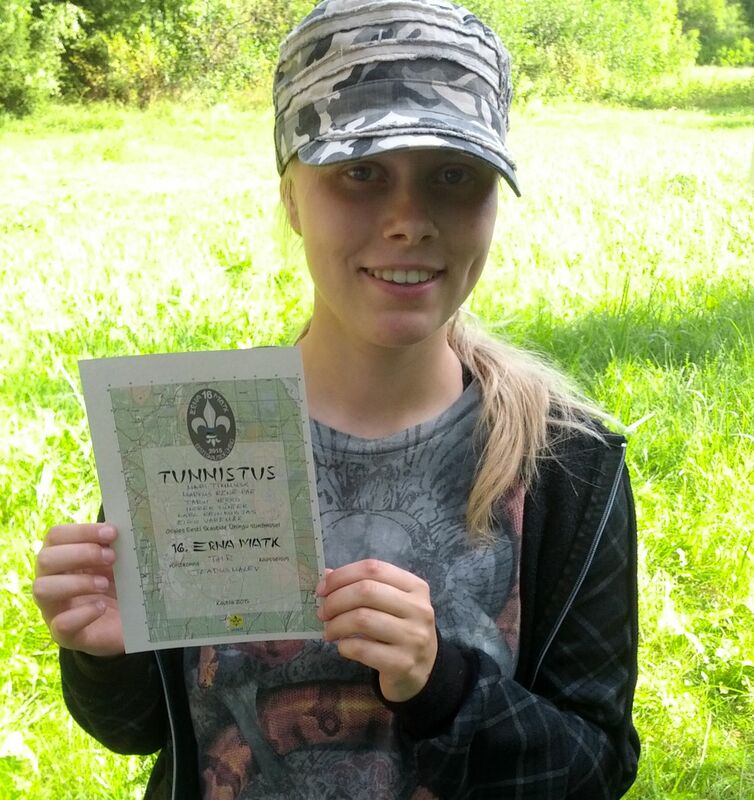 This mostly involved making sure we had all the required orienteering and hiking gear for the competition and we also had a practice hike from Tõravere to Tartu which was a distance of about 30 km. This was an opportunity to test out hiking shoes and general constitution. And then it was time for the competition! Packed into 2 cars with all our equipment we headed to the competition finish location the day before. Our start time was 7:50am on August 9, and this would allow us to have a good night’s rest before the competition. In the morning everyone packed back into the observatory bus, leaving one car behind so we could retrieve the bus later from the start location and we were on our way! It promised to be a rainy day with potential thunder storms during the day but our spirits were high and we were ready to go! Heading towards the first control point, we kept up a good pace and although we made it on location pretty early, we still had quite a line-up ahead of us. 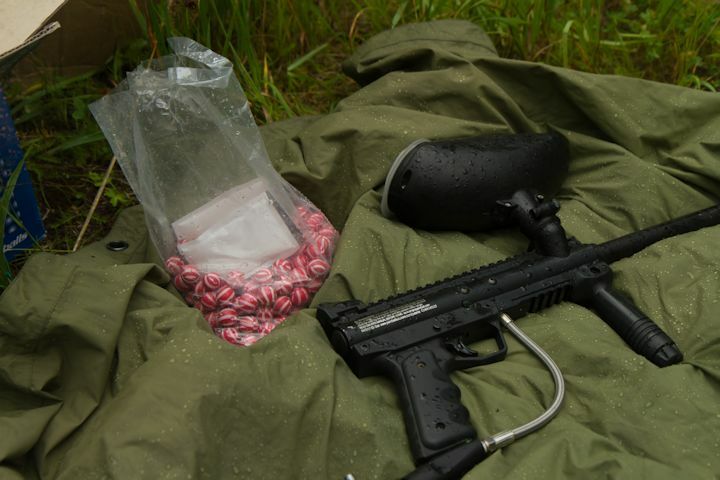 This checkpoint activity was my personal favorite, we got to run around with paintball guns in a capture-the-flag game where we had to shoot all the enemy colored balloons on our way. It was really exciting and just plain fun. Based on our speed or skill, we would be rewarded a maximum of 10 points after completing each activity, and of course we got full points for this first activity. Our hike to the second checkpoint ended up being the most exciting. On an overgrown dirt road we met up with another team who warned us of counter-activity forces in the field ahead, if we got caught by them we would lose one of the 4 lives each team member was given at the start of the competition. We were a bit skeptical so we sent a scout ahead of us to confirm the information. A short while later and we hear a loud “HEY!” followed by our scout sprinting back up the way he’d come. Our team leader took the lead, jumping into the forest at the side of the road and we all followed. 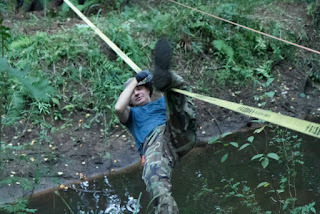 Eventually we made it to the edge of a stream where another team had just finished crossing with a bridge of branches. It was relatively shoddily made so it was already completely fallen apart and we couldn’t use that. While looking for some other way to cross I spied a young birch at the edge of the water and figured that we could potentially hang off of it and let the tree bend over the water so we could cross. I shared my idea and we were able to all make it across alright, getting back on the road in a little while. We got careless though and were caught by countermeasures jumping out of a bush and ambushing us. After that we got a lot more careful and posted a scout ahead of us whenever we were walking on roads so we were only risking one life and not the entire team’s lives. We made it to the second checkpoint after a little bit of backtracking as we went a little too far north in the forest and had to sprint to make it to the checkpoint on time. This was our worst scoring checkpoint, as none of us could solve the rope-lock puzzle that we were presented. Later we learned that only one team had gotten full points for this challenge. The checkpoint coordinators also gave us a mysterious triangle and told us we had to replicate it with natural materials, they gave us no other information so we just took it with us. We briefly met with our other team at the checkpoint and when we saw them again on the road we decided to walk together for a bit. Unfortunately we were separated once again when one of our scouts spotted a counter-activity agent and we all had to flee into the forest. 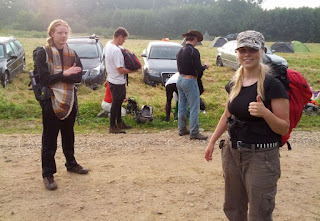 It turns out that we made it to the third checkpoint after our other team and there was another long lineup. We held our lunch here as we waited, refilling our water bottles and eating some of the quick noodle or mashed potato meals we had brought with us. This checkpoint had three activities, one log climbing challenge where we had to reach a tall bar, a basketball challenge where we needed to shoot hoops from the top of a rope ladder and finally a water aiming challenge where we got to fire a fireman’s hose and try to shoot down some beach balls that had to be replaced by team members willing to get sprayed. This was also the closest encounter we had with the thunder storm, as we saw the clouds pass us very closely by but we only got a few drops of rain. 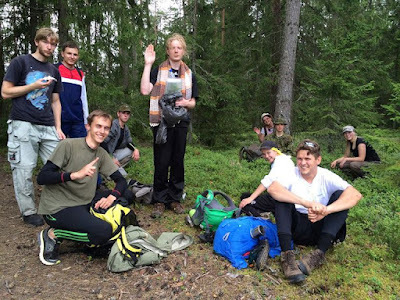 After these activities, we decided to group together with our Kosmosekeskus team and move as one unit. This made our orienteering a lot easier and we were better able to plan our route. The hike to the fourth checkpoint involved some more river crossing and railroad crossing at non-official points so that we could avoid the most likely counter-activity locations. This was fun as just after the railroad crossing we took a brief break and there were wild blueberries everywhere which made me very happy as I ended up just stuffing myself. Making it to the fourth checkpoint we were told that we needed to have our natural triangle ready. Luckily we had collected some materials on our way and before the coordinator could say anything or take away points I took my knife out and we rushed and cut a piece of birch bark to the correct size. The challenge at this checkpoint, as we found out, was to combine a bunch of shapes into 5 identical squares. Some of the shapes were hidden in the forest and we would get points for finding all of those as well. This was relatively easy but we weren’t able to make one square as one was the incorrect pattern. 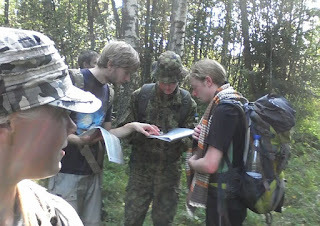 Kosmosekeskus finished their challenge at the same time as us so we kept moving together towards the fifth checkpoint. The fifth checkpoint was interesting. We were presented with a gourmet challenge. 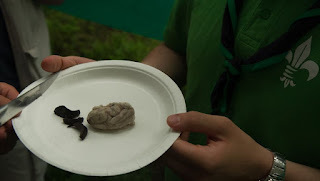 Each member of the team had to consume 3 dishes: a black garlic, some lamb brain and Georgian mineral water. I personally am not very good with new foods but I did manage to finish my part along with the rest of the team. We got full points for this challenge and decided to stay a little longer in order to have dinner. It was slowly starting to get darker when we started to head out again. It was starting to get a little bit more dangerous to take a route through the forest but we figured it might be worth it one last time before it really gets dark and we’d have to stick to the roads. We ended up crossing another river and I would have to say we got really lucky with all of our river crossings, as each place we made it to was crossable without getting our feet wet. It was truly dark by the time we got to the sixth checkpoint. And this was probably my least favorite challenge. It was an adventure park style challenge with ropes and other challenges for crossing a shallow but wide stream. If you fell in the river, you lost all your points. Now usually, I love these kinds of challenges but my problem is that I don’t have a lot of arm strength and the 3rd and 4th crossing was essentially just pulling yourself across with only a single rope across the stream. The first rope was downhill so I could pull easier but the second went uphill and I just barely made it to the other side, my hands hurting and arms completely tired. Me and one other team member ended there when the timer went off but the others had gotten farther so we still got a pretty average amount of points for that challenge. We were informed that there would be no counter-activity between the 6th and 7th checkpoint and since there was quite a large river to cross in our path we decided to take the bridge and go the long way. Some teams went through it and it was supposedly waist height water but since it was also so dark we didn’t really want to risk that path. This was the most difficult part of the hike for me. Not that the darkness was scary in any way, but being tired and having my feet hurting during this time was a real morale killer. The darkness really ate away at my resolve and this is where I thank everyone that supported me through this night. I could not have made it to the next checkpoint if I didn’t have team members encouraging me and singing songs at night to keep our spirits somewhat intact. I could not have done this alone and the fact that we made it to the seventh checkpoint was absolutely amazing for me. It was relatively simple, as we just had to guess the height that a hidden tube was with a pale of water and another tube next to it. We finished this challenge and then moved on to the eight checkpoint right away in order to avoid falling asleep at this place. The walk towards the last checkpoint was still difficult, it was still dark and in order to alleviate some foot pain I decided to walk in my sandals from now onwards. With the counter-activity potentially out again, we tended to spook at every car that passed us by and run into the forest to hide on our way there. We must have looked really suspicious to any non-participant cars that were just passing by! But in the end, we met no resistance and made it to the eight checkpoint with the rest of our lives intact. We had another 3 challenges to complete at this checkpoint: a guess-the-drawing game, first-aid training test, and then a car pushing game that I sat out because of my feet and I doubt I would have added much with 5 strong guys already behind the car! With these last challenges out of the way, all that was left now was to get the orienteering map and head to the finish! 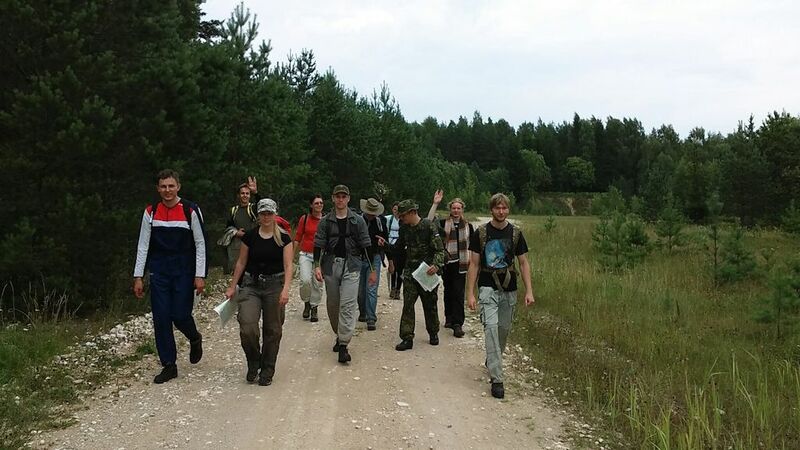 This last part of the hike was the orienteering challenge, we had to collect at least 5 points on the map of 20 locations in order to complete the race and we only had about 4 hours left to go 15 km plus find the points so time was finally starting to run out. Because of this, Teadusmalev and Kosmosekeskus split up again and we headed out first. I knew that now is the time that I would have to really make an effort to go forward. I couldn’t be a burden on my team so I would have to ignore the pain in my feet and my tiredness and just move. Thankfully we assigned a runner to be the one to find the points while the rest of the team would just move towards the finish. This helped as in order to move fast I would have to start moving/limping slow and then slowly pick up the pace and move faster with longer steps. I was only focused on breathing steadily at this point, using it as a focus to let my pain out and falling into an almost meditative state. It seemed to work out well as for most of the 15 km I was even leading the group, I didn’t even want to stop since it would break me out of my concentration and I would have to start all over with my pace building. I could almost taste the finish now, I wanted to get there already! Within the last km or so, we ended up splitting our team, with the walking half going towards the finish and the runners out to get our last points. We even had the Kosmosekeskus team missing their runner catch up to us and so we walked to the finish together. And like that, it was over, our runners caught up to us and we could officially call the hike completed. It was amazing! 24 hours gone and we had come so far, done so much and what an experience that was! With the hike over, we were free to rest a couple of hours until the ending ceremony where the winners were announced and acknowledgements given. We learned that out of the 20 teams that competed on the Tümleri trail, 8 had dropped out. It was surprising, almost half the teams ended their hike and I was so proud that we had made it, we may have gotten 10th place in the hike but at least we finished! This experience was truly worth every grueling moment! It was an amazing opportunity to learn about my limits and about how much I can actually accomplish.